Myself and Adam had our second game of Longstreet last Thursday at the Hobby Bunker, again Adam has posted an AAR on his blog The Fencing Frog. Unfortunately the game was quite intense and we never took many photos. In this my second game, I focused on utilizing the cards as well as their intrinsic abilities. 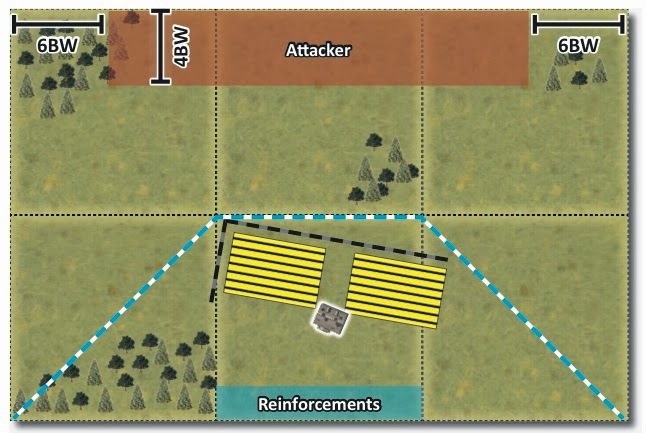 Longstreet is complex game with a simple mechanic. In my first game I was just trying to get an overview. The card driven aspect of the game is great and really everything depends on saving the best cards and playing them at just the right time. For my next game I plan to focus on terrain and well as the innate qualities of the units in respect to shooting and combat. The mechanics of shooting and combat are very similar to Lasalle. 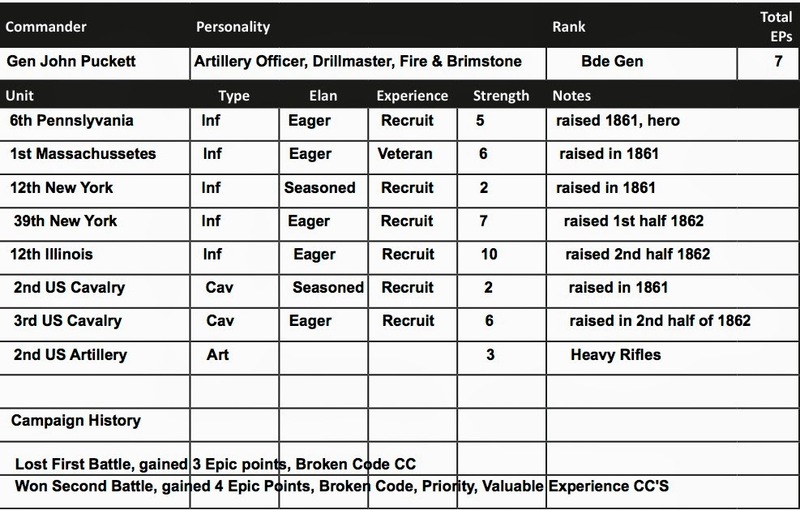 We played the Walled Farm scenario, and as I had the Broken Code campaign card from the first game, I got a +2 on scouting roll. I subsequently won and chose to be the defender. I set up all my cannon in the middle and my infantry on each flank, with one cavalry unit and an infantry unit in reserve. Adam essentially set up in the centre of his deployment zone. Here we can see some of the action mid game, but more on Adam's blog. Well I did score a victory, and earned 4 more Epic Points, I am now only 3 points behind Adam, and the Union does get stronger through each year of the war. The post game process is a lot of fun, essentially you see how many troops die of illness and remove their bases from your roster. You also pull campaign cards which can reinforce or upgrade your troops and also may give you an advantage going into the next game. Here is my roster as it now stands going into game 3. 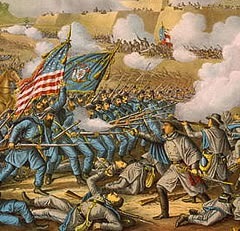 Acquiring some ACW forces: Well the money has been sent and I am hoping to have a fairly hardy Union army in 2-3 months from Fernando and Blue Moon miniatures. I have never utilised a painting service in the past, but I suspect I will be pleased. The Painting Challenge: Well I still have a number of figures painted that I have not submitted, this includes a platoon of Panzer Grenadiers, some Sharpe Practice forces, a small unit of FIW figures that are almost done and hopefully some more Winter War Finns, but alas I will not meet my goal of 1500 points. C'est la vie. Normandy Campaign Terrain: This is pretty well done aside from the base board itself (which is the easiest part). I am about to put together a 4Ground shed and hoping it will size out with my Italeri houses. I suspect I will have this ready for April, the Soviet campaign I am currently involved in is going quite slow, so the timing will work out. A Union victory! Have you chosen a name for your "character"/general? I have never used a painting service either, but a number of local guys have used Fernando,and been very pleased. I have seen figures they painted in person, both local and in person, and they are better than I can do. Just be sure to be very specific about any details that matter to you. Thanks Peter, you can see the name chosen on my roster. An old New England name, descended from one of the first colonists in Salem arriving in 1628, I believe. I feel confident Fernando will work out, I am doing all the basing myself and will do some special figures. Nice report. I've played 4 games on Longstreet and really like the rules - easy to learn but hard to master. As for painting services you might consider MMPS. I've used them a number of times and have been very pleased with the quality and speed of delivery. Fons (the owner) also sends pictures during the process so you can make sure your getting what you actually ordered. The one limitation is he tends to paint only Perry plastics, which isn't an issue for me but some prefer metals. Thank Miles, I would have gone with Fons but they do not do 18 mm figures.